Price Tip: If you hate negotiating and still want the best possible deal, always price shop online first. We recommend Car Clearance Deals, MotorTrend, CarsDirect and Edmunds. These free services will offer you the lowest prices on a new Lincoln and supply you with multiple competing price quotes. You will know the best price before you visit the dealer. 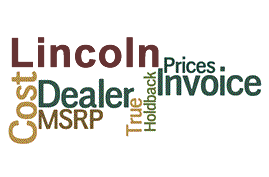 Most people mistakenly believe that the Lincoln Invoice Price reflects what the dealer paid for a new vehicle - The true Dealer Cost. It is not! Knowing the dealer cost of a new Lincoln gives you needed leverage when it comes time to negotiate a great price. Negotiating from the cost up and not the MSRP down can save you thousands on your next purchase. The world of auto dealership and manufacturing can be confusing, particularly if you do not know the lingo. Take the time to learn some key car phrases and definitions, and it just might help you out the next time you step into a dealership to negotiate. The MSRP is the manufacturer's suggested retail price, and this is the figure manufacturers recommend dealers set their vehicles at. The dealer invoice price is the sum the manufacturer invoices the dealer for, as well as the added options a consumer might opt for in his or her purchase. This is the dealer's true cost. The dealer holdback is a platform of payments set up to enable the dealer to keep new models on the show room. The dealer finances the cars through the dealership's financial group. Manufacturer incentives and rebates are incentives and cut backs made directly from the auto maker to the consumer. These rewards are designed to entice the buyers by promising discounts and money rebates in exchange for their patronage. A destination fee is basically a delivery cost, which the manufacturer averages over all the vehicles so it is not added on individually by the dealers. Dealer incentives are incentives offered from the factory directly to the dealer, in an aim to move a certain model or stock that may be in surplus. Often these incentives are goal base, like reaching a certain sale level to get a greater rebate. Regional ad fees are extra costs the dealer pays to the vehicle manufacturer, to cover any advertising or promotions the manufacturer might be doing in the dealer's area. These fees are itemized on the vhicle's invoice, and you cannot typically negotiate these fees. Base Lincoln Invoice Price + the dealer Invoice price of Options + Destination - Holdback = Total Dealer Cost.